Last Tuesday night while Hillary Clinton celebrated her win in New York State, Bernie Sanders moved on from the Empire State and held a rally in Pennsylvania. However, on Wednesday, the day after Sanders held his State College rally, Clinton, too, headed to Pennsylvania to campaign before the April 26 primary. But Clinton is not campaigning in Pennsylvania by attacking her opponent, Sanders, but rather, by ignoring his campaign and focusing on the general election in November. This is because Pennsylvania is a swing state, and one Clinton could have difficulty winning if she does win the Democratic nomination. 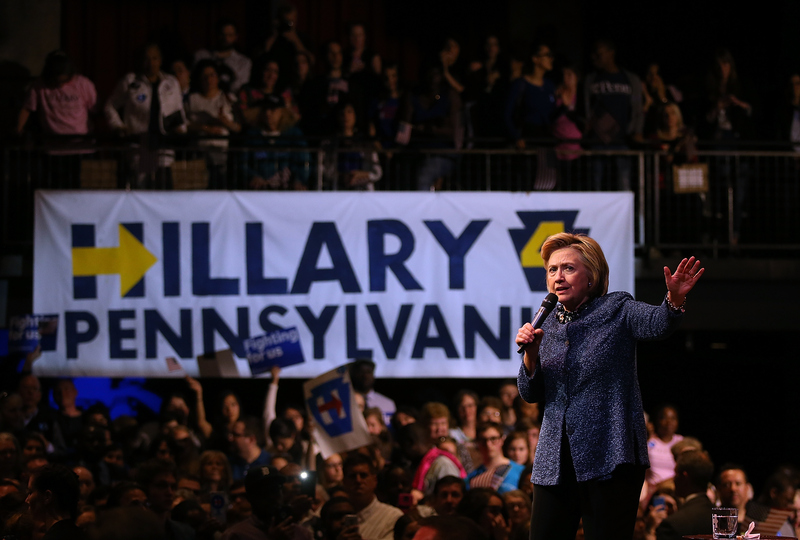 A Monmouth University poll published on April 20 predicted that Clinton will win Pennsylvania by approximately 13 points in the Democratic primary — Pennsylvania would be a big win for Clinton with its 189 pledged delegates. However, even if Clinton does end up winning the Pennsylvania primary, and the Democratic nomination, she may face difficulty winning the Keystone state in the general election. According to USA Today, though Pennsylvania has gone blue in the past six general elections — ever since Bill Clinton won the presidency in 1992 — each year the election has been close, and therefore, it is considered a swing state. Clinton typically does well in states that are racially diverse, which is one reason why Pennsylvania could be a difficult state for her to win in November — Pennsylvania is less racially diverse than states where Clinton has polled well, such as New York and South Carolina. If Donald Trump were to win the Republican presidential nomination, USA Today reported that he could motivate many Pennsylvanians to vote for the first time — Trump often appeals to working-class white voters without college degrees, a significant contingency in Pennsylvania, according to Bloomberg. Though many working-class Pennsylvanians voted for Clinton's husband, Bill, when he was elected to the presidency, a significant portion of the working-class population ended up voting for Romney, not Obama, in 2012. It should come as no surprise then that Clinton is doing all she can to win back voters in the Keystone State, and to ensure her popularity in Pennsylvania. In a speech at the University of Pittsburgh at Johnstown, USA Today reported that Clinton attempted to appeal to both Republicans and Democrats — "When I'm actually in office," she said, "Republicans actually say nice things about me because I will work to find common ground." While attempting to appeal to voters of both parties, Clinton attacked the GOP candidates in her Pennsylvania speeches, condemning their foreign policy, — an issue Clinton is well versed in after serving as Secretary of State — and saying,"When I hear Donald Trump and Ted Cruz talk about international issues, I mean, what they say is not only offensive — it's downright dangerous." With such a statement, Clinton undoubtedly hoped that her message would appeal not only to liberals, but to conservatives who do not agree with Trump and Cruz's often xenophobic foreign policy. In a confident but calculated move at her Wednesday rally last week, Clinton did not once mention her Democratic opponent, Sanders. Clearly, she's more focused on defeating a GOP opponent if she wins the nomination. This can't be a bad strategy — rather than dividing the Democrats, Clinton is focusing on winning over undecided and Republican voters for her party.